Well I finally did it, I updated my website. For almost three years I've had my website looking the way it did before but now I can finally say that I have my own website that I actually designed myself. You see, the old website was just a standard Weebly site design made by someone else that I edited a bit. This design is still based on the old layout but I remade everything but the code, removed a lot of details I didn't want and added things I did want. I might continue editing the site a bit over the coming weeks but I think I've got the general layout sorted out. Please feel free to enjoy my new and improved website! Here it is, finished! It has been a blast working on this thing, adding all sorts of cool stuff to it. I think I've hit the limit though where trueSpace won't let me continue working on it normally but I think it turned out very nice as it is now. Realistic suspension, the Explorer can move like a car, tank or forklift with wheels that can each operate independently. The interior and cockpit, if necessary all colonists fit on board the explorer (though it would be cramped). 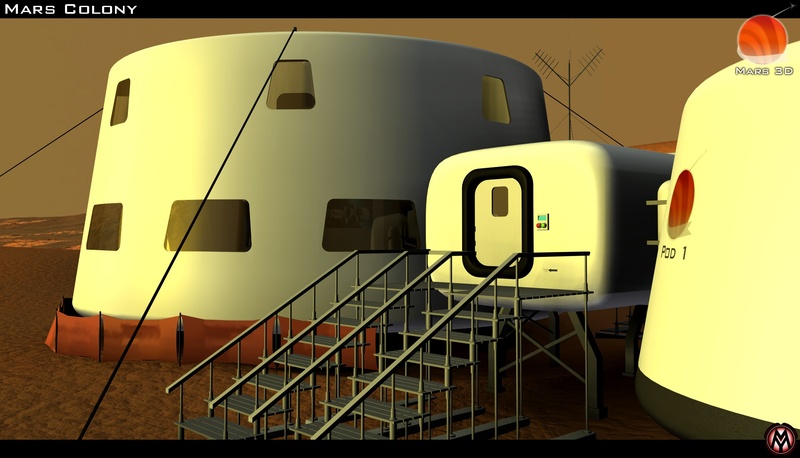 It is designed so groups of three can take this an explore Mars, even can even spend a few nights on board the Explorer if the mission takes them that far away. Some bump maps here and there and a couple of textures. I also did another Let's Play video of me playing Rainbow Six Vegas 2, one of my favorite games. Here is the colony finished. I haven't built any interior details yet though I have finished the general layout. Maybe I'll make an animation touring the colony just like I did with the Athena. I hope people will like it, after all someone will have to live there some day. 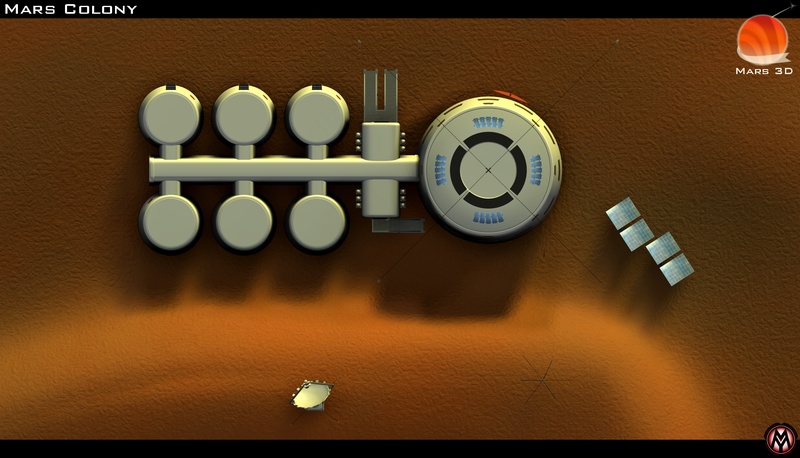 This is the colony where seven or eight colonists can live and study Mars. The main living hub (left) has the communication room, living areas and library. The six smaller hubs to the right have various functions such as cultivating plants for food, storing power, research equipment, storage for other equipment and life support (for backup). Each Hub is deployed from orbit separately and assembled on the surface. The main hub is encased in a protective shell to keep it safe during entry to the atmosphere. Other parts of the colony are assembled parts also delivered in a protective shell. Now that I got trueSpace working again I can continue on my project. I made a proper render of the spacecraft and also managed to get a decent WIP shot of the colony itself. This space vessel is assembled in space allowing several large components such as the main living hub and the life support, research/science and botanical hubs to be deployed on Mars as they are now. This saves assembly time for the colonists but is however more expensive. 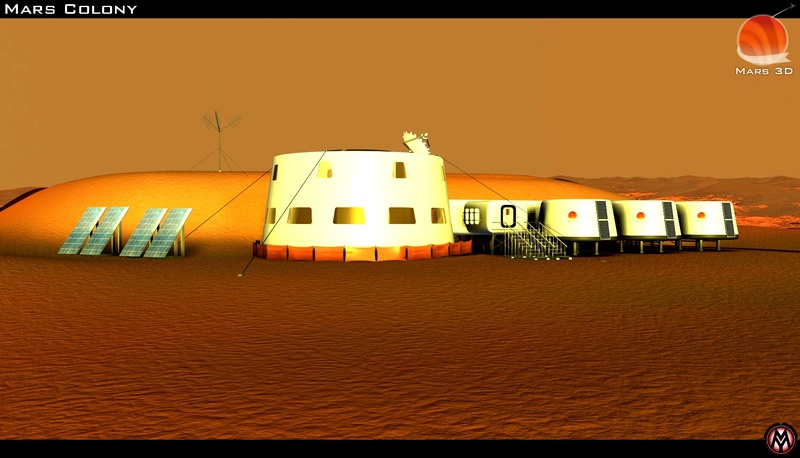 This is the colony where eight colonists can live and study Mars. The main living hub (left) has the communication room, living areas and library. The six smaller hubs to the right have various functions such as cultivating plants for food, storing power, research equipment, storage for other equipment and life support (backup). I also, during the problems I had with my 3D program, made a little character called Mr Brushy. He is for the United 3D Artists Graphics Challenge, theme: Cartoon Character. That's it for this blog, more updates will follow. Have a nice day! 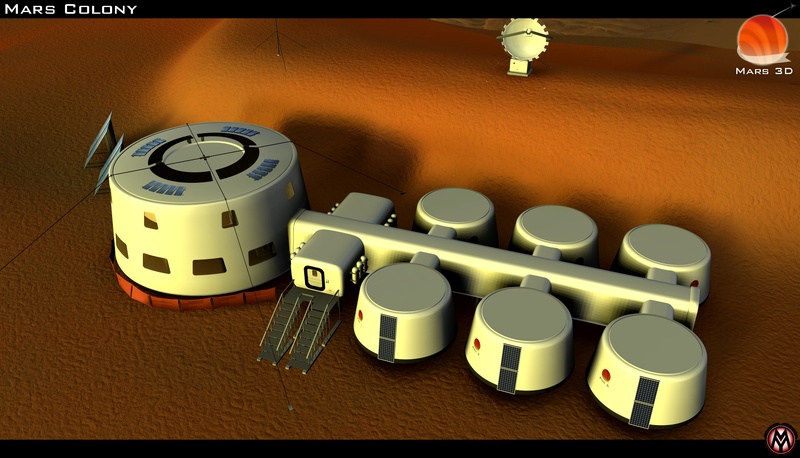 Here is a new idea I'm working on, colonizing Mars. There are a couple of companies already working on this idea and I felt inspired. I have also played around with the idea in my mind for quite some time. 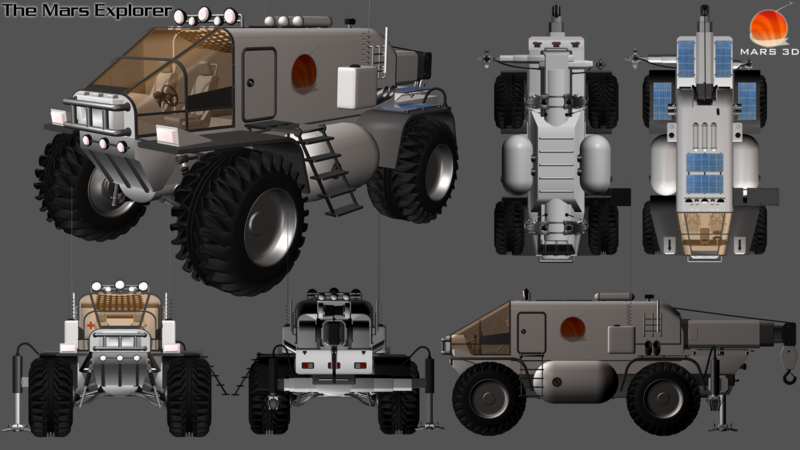 This is the Mars Colonizer, it is a space vessel assembled in space allowing several large components such as the main living hub and the life support, research/science and botanical hubs to be deployed on Mars as they are now. Right now the colony itself is the most complex scene and also the first scene I started working on however since I've been having some big tS problems I won't be able to continue and render it. Same with this scene actually, however this one was easier to create a somewhat decent workspace render out of. Updates will follow... I hope. Here is a low-poly version of the Su-47 Berkut experimental fighter aircraft. I updated Xali a bit. Before she had stability issues and lacked parts in some areas. Now I have redone the design a bit, she has different shoulder armor, redesigned her upper body, upper legs and lower legs, the feet have been made smaller to look better and I also replaced all light blue parts with black ones making her black and dark blue only. This 40 cm (15.7 inches) tall warrior queen has taken most of the parts I recently acquired. However I'm quite happy with the result. Xali really is a queen, or rather was. She came from an empire now long gone. She has been traveling ever since its fall, never staying in a single place more than a day or a week. She has no companions, no friends and her enemies are all long since defeated. Got some new pieces to work with, this is the first thing I built. It is some sort of WWII themed aircraft. The landing gear goes up and down but that's about the only function it has got.